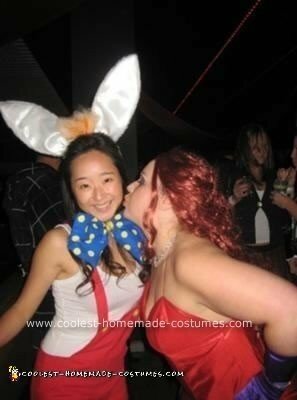 This homemade female Roger Rabbit costume all started with a basic red romper. I replaced the original buttons with yellow ones and cuffed the bottom of the shorts. I found white & blue polka-dot fabric and painted in the white circles with yellow fabric paint. Using the modified fabric and yellow ribbon, my sister sewed up the bow-tie and included a clasp in the back for easy removal. I love this costume! 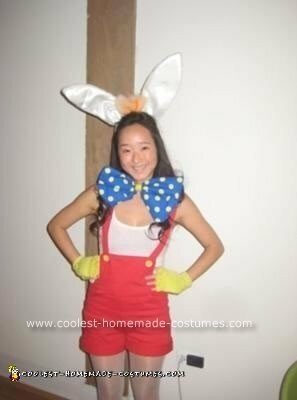 I’ve never seen such a cute Roger Rabbit outfit. Where did you buy the red romper? I can’t find it anywhere! Thank you so much for this post. It inspired me! My husband and I did Jessica and Roger and this put a cute twist on the Roger costume. I got so many compliments, but it was all because of your post. Thank you for the creativity!